Sri Lanka has called for the establishment of a rule based maritime order in the Indian Ocean before ‘geopolitical power interplays in the region to convert the Indian Ocean into a centre of tension’. Prime Minister Ranil Wickremesinghe delivering the keynote address at the ‘Indian Ocean: Defining Our Future’ Conference held at Temple Trees yesterday said the security and stability of the Indian Ocean could not be left to chance and that states needed to take advantage of the “benign strategic atmosphere that exists to create a maritime order in the Indian Ocean that can withstand the challenges that may emerge in the future”. This could create a more ‘manageable future’, he added. Sri Lanka, the Prime Minister noted has taken this proactive step to provide a platform for dialogue among all partners in the region, as its economic prosperity depended on a stable rule based maritime order which would ensure that all states both small and large are treated equally. Similarly in 1973, Sri Lanka chaired the UN Conference on the Law of the Sea which led to the adoption of the UN Convention on the Law of the Sea (UNCLOS). 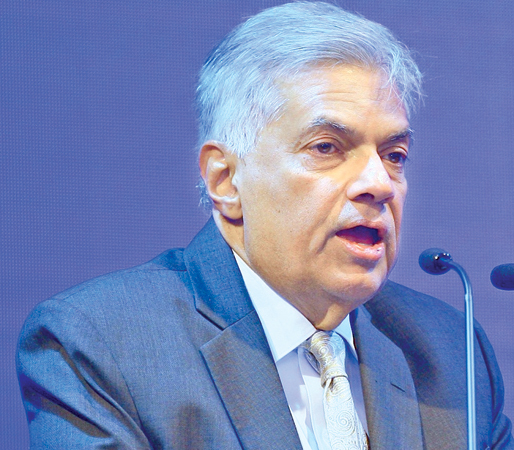 The Prime Minister also asked that the Global Maritime Crime Program of United Nations Office on Drugs and Crime (UNODC) help the Sri Lankan Government to set up an ‘International Centre of Excellence on the Safety of Undersea Cables’ in Colombo. He further invited all countries represented at the conference to send an expert to ‘augment the intellectual and technical capacity of the Centre’. Over 80 percent of internet traffic is transferred using undersea cables and all of the digital connectivity between the West and East traverses over the seabed adjacent to Sri Lanka. The Centre would help assess the security imperatives, threats, vulnerabilities and responsibilities around the growth of undersea cables to ensure uninterrupted digital connectivity around the world. The Conference which would have discussions touch on the themes of: The Indian Ocean Economy: The New Global Growth Pole; Life Below Water: Reframing the Oceans as Development Spaces; An End to Uncertainty: Safety and Security at Sea; and Reinforcing International Law in the Indian Ocean: UNCLOS and Emerging Issues, had the Prime Minister make special mention of the need to discuss the grey areas in UNCLOS. “States are somewhat hindered in taking measures against non-state actors on the high seas and despite the UNODC piracy prosecution model, a long-term solution to effectively combat and prosecute maritime crime is needed. "Another is the sustainable exploitation of undersea resources and the partnering with other states to exploit such resources,” the Prime Minister said. “UNCLOS thus would have to be reviewed to look at ways in which these resource partnerships would be ‘equitable and ensure that these untapped resources would benefit everyone in the region,” the Premier added. The Prime Minister hoped that at the conclusion of the forum, they would be able to arrange a ministerial conference and reach a political understanding over the issues discussed, “Business as usual scenario cannot end well for the region, as current geopolitical trends can have unforeseen consequences for all of us”, he warned the delegates.